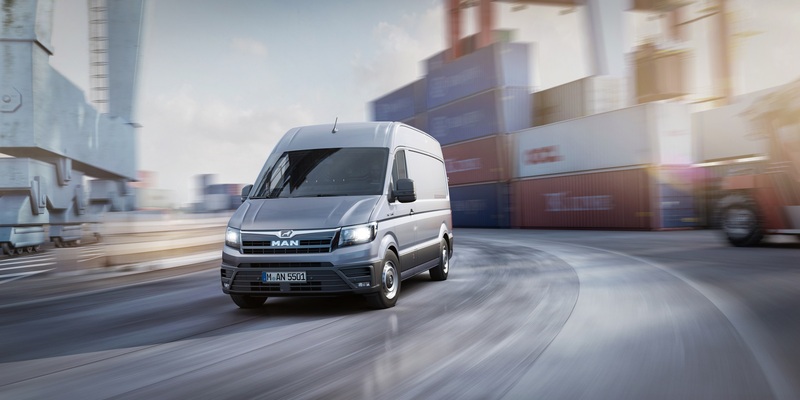 The new MAN TGE range will run from 3.0T to 5.5T and will be available in Panel Van, Chassis Cab and Double Cab derivatives. Two wheelbases, three roof heights and three vehicle lengths provides a line up consisting of 69 different variants. Panel Vans with a load volume range from 9.3m3 up to 18.4m3, chassis cabs with platform lengths of up to 4.7 metres and a towing capacity of up to 3.5T the new TGE will give customers a wide range of options to suit their specific application. A completely new generation of diesel engines specifically designed for reliability, durability and long service life powers the new TGE. The 1,968 cm3 diesel engine comes in four different power outputs: 102 PS, 122 PS, 140 PS and 177 PS, delivering torques of 280 Nm, 300 Nm, 340 Nm and 410 Nm respectively. Front Wheel Drive, All Wheel Drive and Rear Wheel Drive systems are available across the range with the choice six-speed manual or eight-speed fully automatic gearbox. Emergency Brake Assist (EBS) is standard across the entire range with a series of other class leading ‘Driver Assistance Systems’ and options being available. With a professional ‘Truck’ cultured service network offering extensive opening hours that includes evenings a weekends, the new TGE will appeal to those operators who demand the same aftersales approach to their light commercial vehicles as they do to their heavier commercial vehicles. Innovative digital and fleet management solutions will provide safety, duty of care and legislative compliance in the light commercial sector giving operators peace of mind. Mobile 24 Roadside Assistance together with a commercial ‘Uptime’ attitude across the entire MAN network will ensure maximum vehicle availability at all times.